Manchester United and Arsenal played out a thrilling draw on Wednesday night. This was thrilling and excruciating in equal measures, one to have the juices flowing, but also a vindication of both teams’ respective positions in the table. Whether it was United presenting the visitors with a lead, and then, having revived, carving them open at will only to fluff their lines in front of goal, or Arsenal wilting at the back as if defensive responsibilities were discarded along with Arsene Wenger, deficiencies were to the fore. Manchester United are lucky to have someone like David de Gea as their last line of defence, bearing in mind the number of times he denied Arsenal a goal. The 3-4-2-1 formation which both the teams set out with seemed to make them vulnerable at the back and it was all about who accepted the greater percentage of chances. Jose Mourinho made as many as seven changes from the 2-2 draw at St. Mary’s, handing Diogo Dalot a Premier League debut and Marcos Rojo his first start since the World Cup in summer. And, they started on a positive note, displaying authoritative passing and monopolizing possession. Marcus Rashford was ever willing to run at the defence with Martial looking to penetrate from the left. But for the majority of the game, despite attacking in numbers, chances weren’t created and in some cases, weren’t capitalized on. Arsenal, on the other hand, were a bit sloppy with several passes going astray and evidently unable to break down a well drilled Manchester United side. Eric Bailly was rock-solid at the back, clearing the lines and sometimes driving into the opposition half to feed the ball to the forwards. Then, in one of the most bizarre circumstances, De Gea failed to grab Mustafi’s bouncing header cleanly which had to be one of the most routine stops, to see it agonizingly loop across the line. Amidst an appeal for a potential foul on Smalling, Herrera cleared the ball away, but it was too late as Andre Marriner already pointed to the centre-circle after checking with the goal-line technology. But, the lead couldn’t be sustained for long. 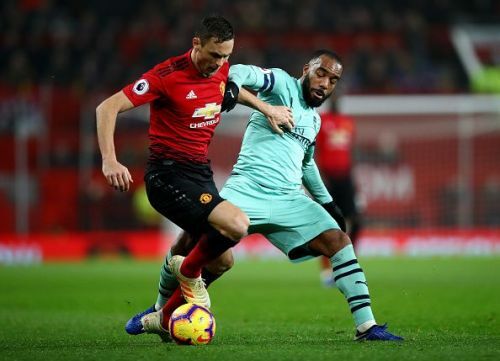 Anthony Martial was clipped by Guendouzi outside Arsenal’s 18-yard box and the punishment extended beyond a foul. Rojo’s free-kick, however, was parried by Leno. Ander Herrera, then, darted to the byline to cut it back across goal and the opposition being unable to clear the lines paved the way for birthday boy Martial to blast home from close quarters. It turned out to be one of the talking points of the game as replays suggested the Spaniard to have been offside. Just when the Gunners seemed to get to grips with the game, they suffered a blow in the form of Holding’s premature ending as he badly twisted his knee to be replaced by Lichsteiner. It was equally poised at the break as the first essay ended with Aaron Ramsey found hobbling around, who was to be replaced by Mkhitaryan and some reckless play from both sides with a total of 5 players booked in the space of 8 minutes. United, however, increasingly lacked the cutting edge. Several occasions when Martial or the debutant Dalot meandered down the flanks only being either unable to dispatch a proper cross or find someone better-placed. One through ball and the flanks were activated, but they desperately struggled to get it through the middle. Lingard, deployed as a false-nine could hardly make an impact as the defensive duo of Sokratis and Mustafi would not tolerate any nonsense, blocking and plunging to great effect in a bid to clear their lines. On the other side, however, Rojo fell prey to the visitors’ high press, gifting the ball to substitute Lacazette whose one-two with the Armenian set him up with only Leno to be beaten. It ultimately culminated into Arsenal’s second of the night as Rojo slid in, catching the majority of the ball, helping it roll into the net with De Gea caught wrong-footed. The own goal allowed the otherwise gasping Unai Emery let out a sigh of relief, but the tension came back exactly after 60 seconds. United hit back as the opposition's defence failed to clear Rojo’s long ball deep into the penalty-area with Lingard charging in to slot home the equalizer through Leno’s legs. Old Trafford erupted yet again and fleetingly sensed a comeback in keeping with United’s dashing traditions was on the cards. The Arsenal midfield, however, outplayed their counterparts in every department, both in terms of skill and energy. United desperately lacked the firepower and seemed a bit laid back in their approach. But, Emery’s switch to a two-striker formation, bringing in Lacazette off the bench, changed the entire dynamics of the game. In fairness, though, Sead Kolasinac was the standout performer filling in at left wing-back. The Bosnia international’s pace and slick passing was a treat to the eyes. Not only did he cut down Rashford and Dalot’s threat, but also produced some fantastic bursts rampaging down the flanks delivering pin-point crosses which his teammates, however, squandered. While Leno was largely untroubled, David de Gea merited praise as he blocked an Aubameyang shot from point-blank range and then Torreira’s effort from around the penalty spot. But, it would hurt the Arsenal fans the most going into the night replaying Mkhitaryan’s miss in their minds. The highly instrumental Kolasinac’s cross was met by the Armenian only to sky it over the crossbar on the volley. Arsenal now slip out of top 4, but would surely like to cling onto the positives from the game. Some of their approach play in the final exchanges had been scintillating, and far too good for United to repel, but it was the memory of all the misses that lingered. All three points were there for the taking, but there would not be a first league win at Old Trafford since September 17, 2006.